I have mixed opinions about Deadpool as an entity. In theory, he is probably the bad-assest comic character since The Flaming Carrot, but the rabid fanpeoples and casual comic fans on a certain microblogging platform really grind my nuggets. But whatever, Deadpool has been growing in popularity over the last few years. Probably based on Hollywood’s favourite apathy factory, Ryan Reynolds, playing him in that Wolverine flick or something. 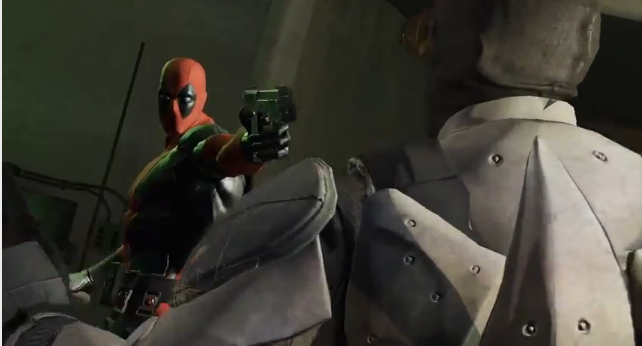 Based on his own merits, Deadpool is a don. Nolan North has voiced Deadpool in a bunch of different stuff, and though I generally prefer anything when it’s John Kassir, I think North usually captures the character’s insanity pretty well. However, in this game trailer, the voice acting is about as accurate as Stevie Wonder at a rifle range. It just sounds like Stock Action Voice Big Chin Guy, which isn’t good, and definitely isn’t Deadpool. High Moon seem to get it though, you can see it in the silly touches, like the onomatopoeia. Anyway, this trailer. Game teasers are a tricky wicket, aren’t they? The big question is always; “How much of that flashy light show is in-game footage?” It looks to me like some of the latter stuff could be playable, and it looks pretty smooth with it too. As a person who has only recently discovered the power of modern gaming (thanks for that, Fallout 3), I imagine this will be everything I wanted Arkham Asylum to be; a shooty, laugh-fest with am FPS RPG engine. Please? This entry was posted in Stuff. and tagged Comics, Deadpool, Gaming, High Moon, John Kassir, Marvel, Nolan North, Video Games, Wade Wilson, X Men. Bookmark the permalink.